Who would have thought two little words would make such a big difference? Perhaps not little words, but the simple placement of Welland, Ontario. 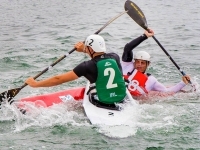 Action on the calm waters of Welland Recreational Canal was fast-paced this weekend as canoe polo players battled it out in a lead-up tournament to the International Canoe Federation (ICF) World Canoe Polo Championships later this month.